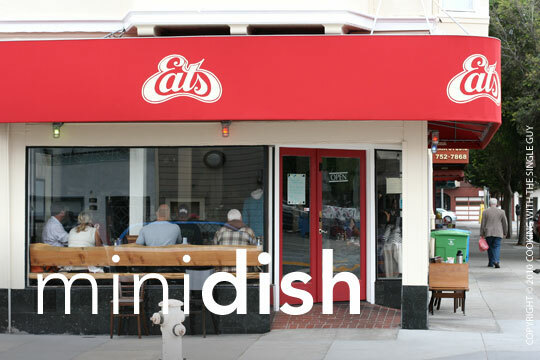 I like to support the local businesses in my hood, and one that I've written about and visit often is Lush Gelato on Piedmont Avenue in Oakland. This tiny gelato store with unique flavors have been such a hit that it expanded into a second location in Berkeley's Gourmet Ghetto. And right now, Lush Gelato is running a contest to find a new flavor. For me, it's hard to imagine a better flavor than my all-time favorite at Lush, which is the basil ice cream. 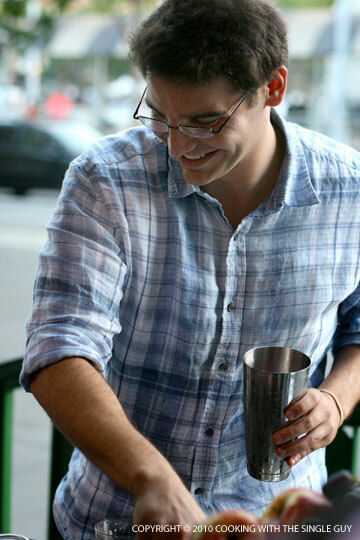 But owner Federico Murtagh is looking for a "people's flavor." So if you have a suggestion, you can submit your idea in person at either one of the two stores or visit their Facebook page. Hurry, because the contest ends on Oct. 8. There will be an online poll to choose the winner, and if your flavor is chosen, you get to name the flavor and get a month of free gelato! Yum. 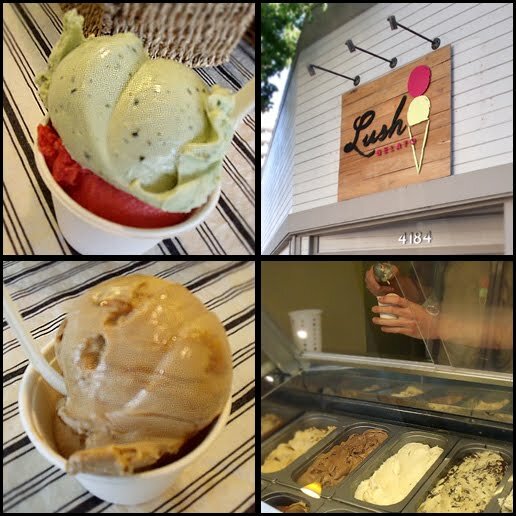 When the flavor is made, Lush will host a two-hour free gelato party. Follow my tweets and I'll send out word when I hear when that party drops. I think I'm going to enter with my own idea. 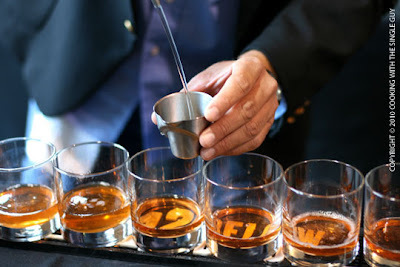 Of course, all my flavor ideas will have to have some kind of alcohol like they do in Buenos Aires. Sabayon or something with rum. I taste a winner! Lush Gelato, 4184 Piedmont Ave., Oakland, and 1511 Shattuck Ave. (in Epicurious Garden), Berkeley. Open daily from 8 a.m. to 3 p.m. 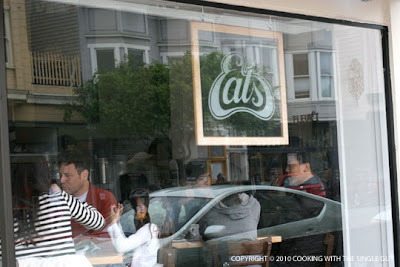 Awhile back when shopping on Clement Street, I noticed this restaurant with a diner motif simply named Eats. It was the weekend and there were people waiting outside, so I knew this was a place I needed to check out. 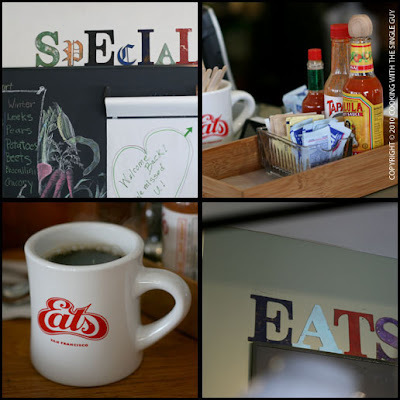 Doing some research, I learned that Eats went through a renovation last year after it was taken over by the people behind the cult popular Burma Superstar just a few blocks away. 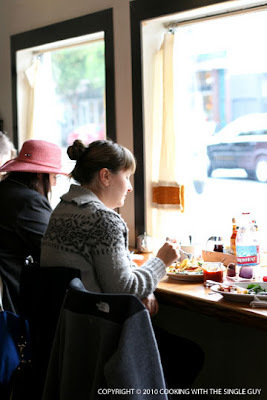 I also learned that it was popular for brunch, so I came on a Saturday for brunch with my friend Ken. We got there early, but the place was still packed so we got the very last table for two – a tiny table tucked into the corner that could fairly be described as half a table. But it didn’t matter because I was so mesmerized by our surroundings. Eats was decorated with a whimsical touch with a bit of nostalgia. 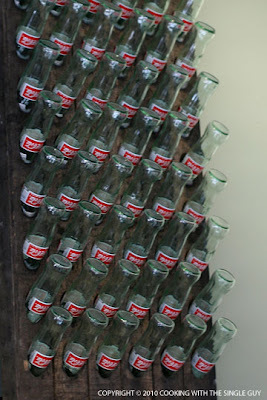 One of its more signature look is the wall of empty Coke bottles. 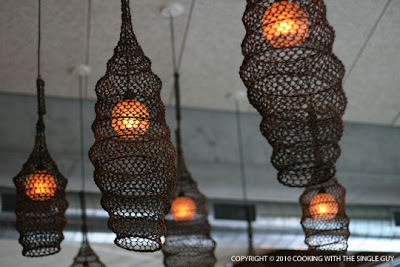 But everything about the place had a fun yet stylish vibe. The menu is your typical brunch offerings of eggs, pancakes, waffles and sandwiches, but the fresh seasonal ingredients signal that the chef is looking for creative dishes with quality flavors. 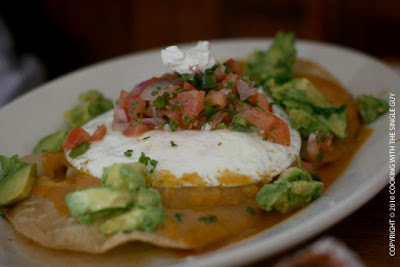 Ken went with the brunch favorite in California, which is the huevos ranchos. His plate came out looking fresh with the tortillas, cheese, avocado, eggs, and salsa topping. Ken seemed to enjoy it. I couldn’t decide what to try, so ended up getting a build-your-plate special, starting out with two eggs over easy (just because it sounded so diner classic) with home fries. And instead of toast, our waitress suggested I subbed it for the waffle so I could give that a taste (excellent suggestion) and I got an additional side of chicken apple sausage. The eggs were perfectly cooked, the exterior with no signs of grease burns and the inside yolk not overly runny. 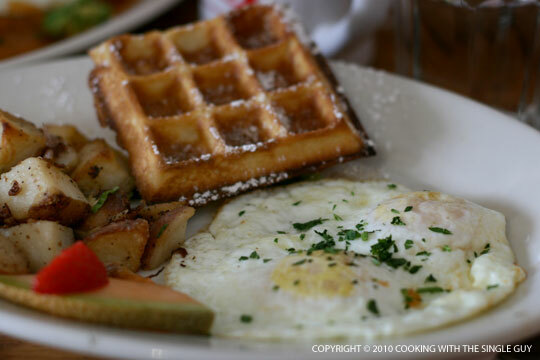 But really the best part of the plate was the waffle. It’s been a long time since I’ve had waffles, but the crunchy texture but cake-like filling was so perfectly done. A guy at the table next to us looked like he had a special dessert waffle plate topped with fresh fruits, and that looked like my Everest to try one day! The sausages came out late when I was almost done with my plate. They were OK, but looked slightly burnt. That did give it a crispy edge. 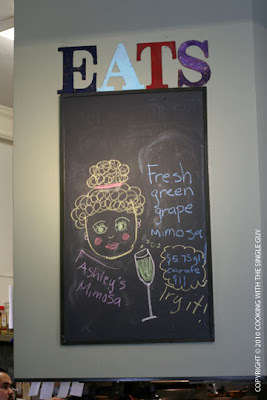 This is a mini review since I just visited once, but the freshness of the dishes and the cozy and fun ambiance makes this a definite brunch destination. I would definitely be back, waiting amongst the weekend crowds. This weekend was a hot one in the Bay Area, so it was a good time to be outside. Which made it perfect for Out and About in Rockridge, the annual street party in my Oakland neighborhood. 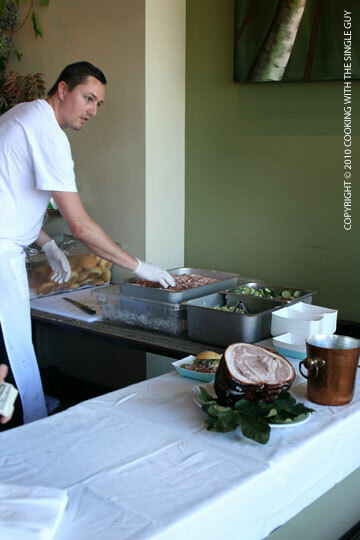 On Sunday, College Avenue closed down from the Rockridge Cafe all the way to the border of Berkeley near the Wood Tavern restaurant. It was a mix of food booths, retail stands, community organizations, and health tent. 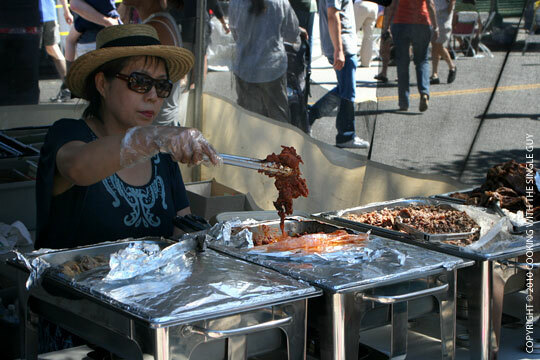 At the heart of the street fair were booths pulled together by Market Hall's Pasta Shop, which they called "Picnic on the Streets." 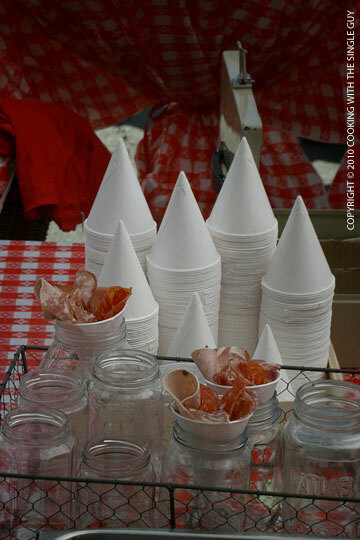 There were a bunch of booths with many tastes of things sold at the Pasta Shop like olive oil, cheese, and the charcuterie cone above. 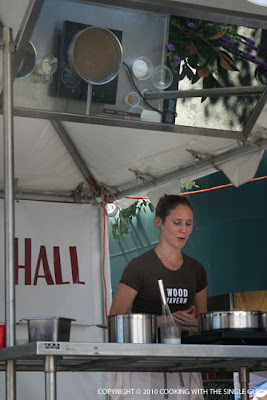 There was a chef's tent that had cooking demonstrations throughout the day. Here Sara Ballard, pastry chef of Wood Tavern, demonstrates how to make a butterscotch pot de creme. Across the fair at the actual restaurant, workers were selling porchetta sliders for $8. 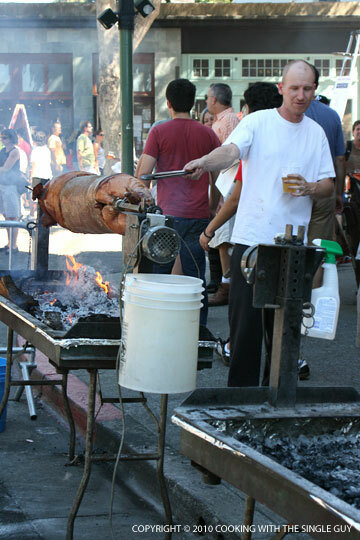 But I didn't try it, even though I'm a fan of Wood Tavern, because I had already eaten a porchetta sandwich earlier in the fair. 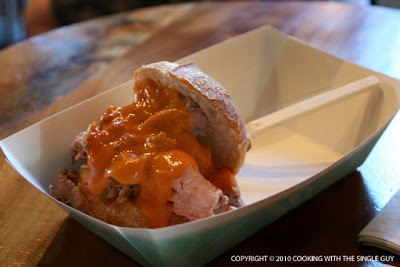 Here's Oliveto's porchetta sandwich, also for $8. It was a bit hard to eat on the bun, and didn't have much flavor. I wasn't really sure what the orange sauce was. 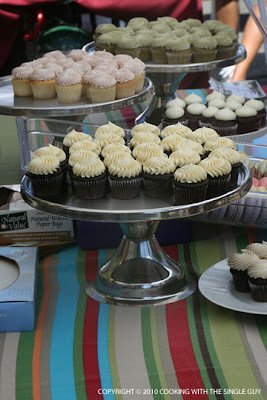 I also tried a cupcake from this stand called Indie Cakes. It's a wholesale cupcake maker trying to break into the retail side. They were selling mini cupcakes for $2, which actually seemed like a lot. I did try the chocolate with passion fruit butter cream, and the butter cream frosting was a bit too buttery. The chocolate cake was nice and moist. I was surprised to see a booth from Ohgane Korean BBQ restaurant. It's not exactly in Rockridge, but I guess close enough on Broadway. Korean BBQ is always tempting, but I wasn't about to order a whole plate of bulgogi or bibimpbap for $9 each. I wished they offered a mini bowl of BBQ chicken, but they didn't. It was fun hanging out in the hood because I got to get a lot of my favorite things, like a watermelon agua fresca from the Cactus booth or a slice of pizza from Pizza Rustica. And with a slight breeze, it made the hot fall day (or Indian summer) the perfect setting for mingling with my neighbors. On Wednesday night, I got drunk. But in a good way. 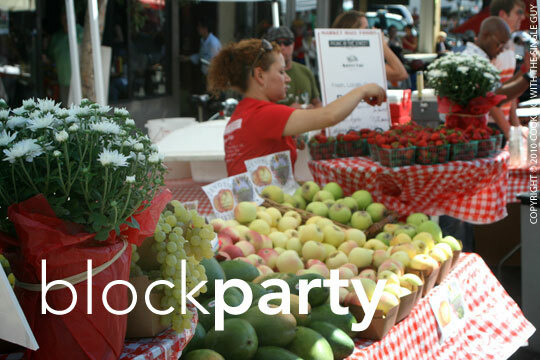 It was the Farmers Market Happy Hour that's one of the many events this week as the city celebrates Cocktail Week. This event, which I went to two years ago, is put on by CUESA and takes place at the San Francisco Ferry Building arcade. Bartenders from some of the city's hottest lounges mixed up specialty drinks using farm fresh fruits from the season, and a few restaurants served up appetizers so people wouldn't get totally drunk. But this year there seemed to be fewer food booths, which explains how I got drunk so quickly. 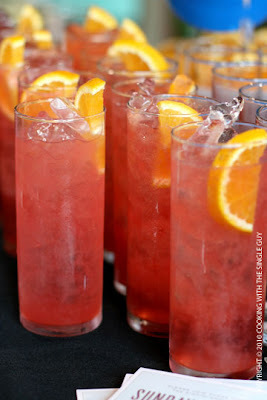 It seemed a lot of the bartenders were using citrus and stone fruit, like plouts. But some people cheated where they only used fruit-flavored syrup or infused alcohol as their drink, so they weren't exactly farm-fresh. But really, I was more interested in the food. Like I said, there seemed to be fewer restaurants serving up dishes, but they were serving up some fantastic-tasting food and a lot of it. 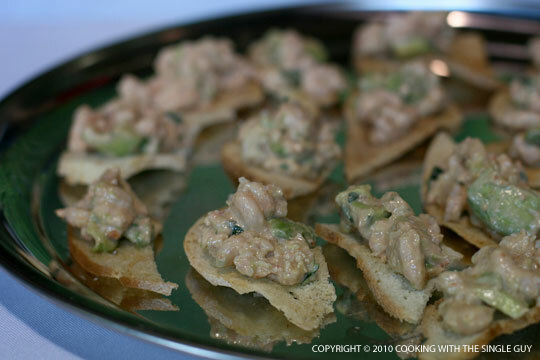 One of the first booths I hit up was serving up this shrimp Louie and avocado toast, made by Chef Carlo Espinas of Comstock Saloon. The combination is classic, and it was a nice serving on each perfectly thin toasted slice. Another classic combination was still a winner in taste. 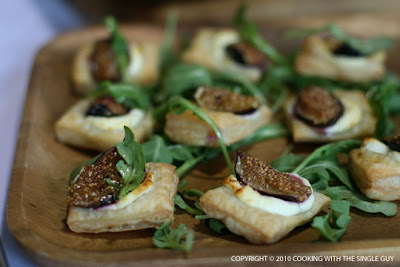 And that's this Black Mission fig tart with goat cheese from the Plant Cafe. 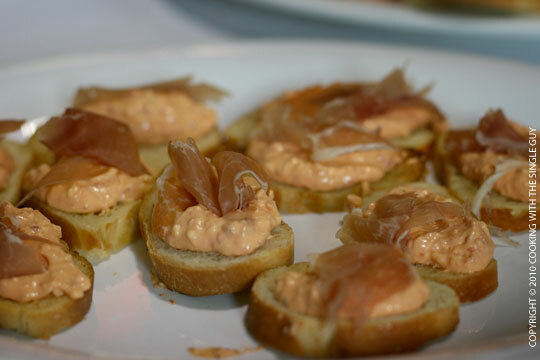 This is the Pimento cheese spread on toast with country farm ham thinly sliced like prosciutto from Chef Scott Youkilis of the new Hogs and Rocks. Again, nothing surprising but all the taste profiles were just on the mark and filling. For the $40 admission ticket, you get to eat all the small bites and tasting cups from the bartenders. But you also get two full-sized cocktails. The first one I tried was the "September Breeze," which had a long list of ingredients and required several different layers to build it into this perfect drink. The bartender started off with angostura bitters, then added bing cherry extract, martini rosato, and 42 Below honey vodka from Australia. Then there were honey, fresh lemon and soda water and a spritz of verbena water. Very complex and very well balanced. The second full drink was called "Papa Ghiradelli," and it was good but nothing spectacular compared to the September Breeze. So that's probably why I didn't take notes on the ingredients, but it may also be that by now I was totally wasted. It was interesting watching the bartenders mix up their drinks, which had some interesting names like The Remedy, Little Horner's Luck, and Square Peg, Round Hole. Oh, one more food shot. This was actually the night's best and my favorite, IMHO. It's a skewer with grilled Shishito pepper, feta cheese with a slice of coppa, and watermelon. 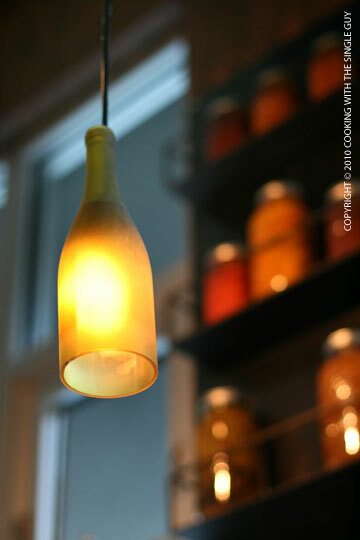 This was dreamed up by Chef Jake Kwan-Rosenbush from 15 Romolo. 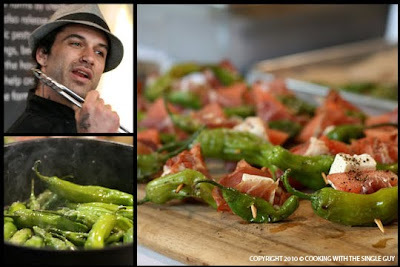 He was frying up the shishito peppers at the stand and it was my first time trying this "in" pepper and I totally love it. Everything on this stick was amazing and a perfect representation of summer. As for my favorite drink, I have to give it to this guy, Joel Teitelbaum of Zero Zero. He created something called a "Her Royal Vintage" and this isn't a shot of it above. 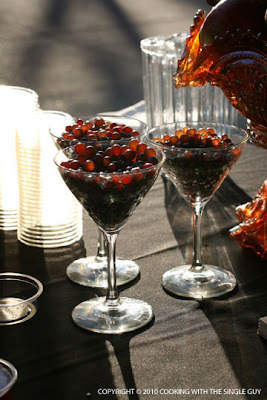 That's just a photo of the glass holding the tiny grapes that were thrown into the drink. 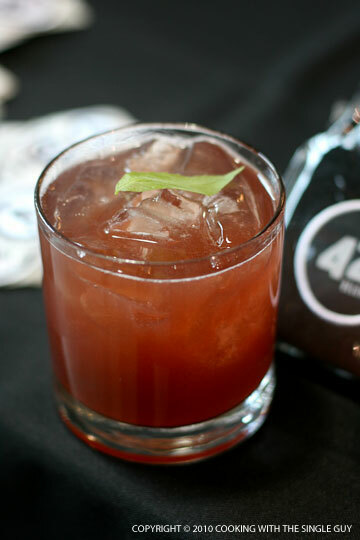 The drink is made with brandy, Campari and spiced apples and Concord grape syrup with a bit of balsamic vinegar. Everything tasted fantastic and was well balanced. 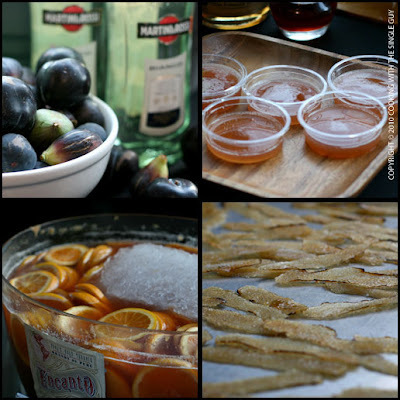 (Some drinks I had at other places were too strong or too weak, but this was just the right amount of alcohol and sweetness from the fruit.) 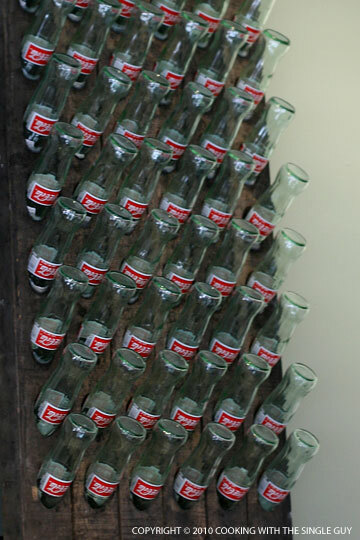 I would give Joel a blue ribbon if I had one. So it was a fun night of munching and drinking, and watching the bartenders at work. One thing I did learn is not to drunk tweet, which always can be too much information. 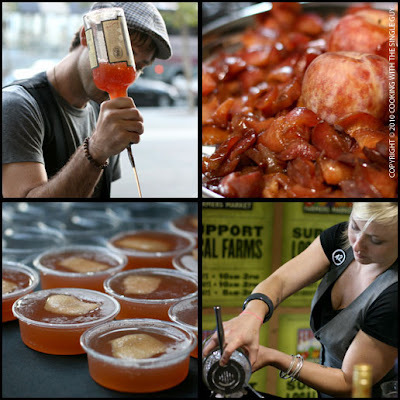 San Francisco Cocktail Week is wrapping up, but there's still some events you can get to. 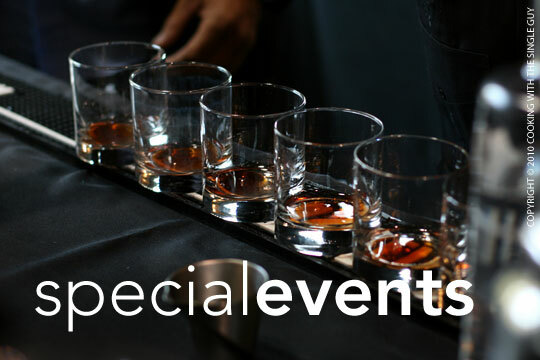 So pull up a stool and raise a glass to the season's best. Open for weekday lunch, 11:30 a.m. to 2 p.m.; dinner nightly, 5 to 10 p.m.; and weekend brunch, 10 a.m. to 2:30 p.m. I don’t know how restaurant critics go out every night. The rich dishes of some of the places we tried was really weighing on me by the end of their visit, so when my sister said we could go somewhere non-Chinese, I suggested the lighter fare of Gather Restaurant in Berkeley’s David Brower Center. Gather is known for its seasonal and organic ingredients, sustainable cooking, and emphasis on vegetarian dishes (although it’s not strictly a vegetarian spot). I thought the vegetable dishes would help us balance the days of carnivores gorging. We started off with restaurant’s signature vegan “charcuterie” plate ($16), which I remember to be a beautiful display of vegetable creations on a wooden plank. Like the last time, the tray had too many items to get all into one shot, so I had to shoot the plate in pieces. Because Gather’s menu changes by the season, so do the charcuterie plate’s featured items. None of the items were on the platter I tried during my first visit. 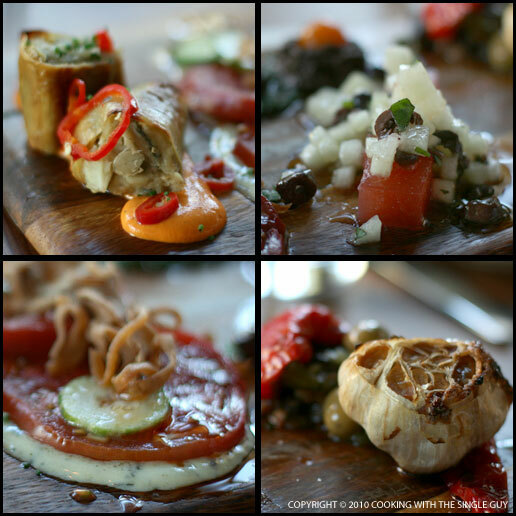 This time around there was a tofu skin “sausage” with pepper cashew “cheese” and pickled frigitellos, carpaccio of heirloom tomato with Puglian cucumber and tonnato sauce, compressed watermelon steak with smoked Canary melon lardo and nepitella, mushroom tartare with horseradish salsa verde and porcini oil, Sicilian infant eggplant, Jimmy Nardellos, and an entire roasted garlic bulb. My Mom was a trooper in trying some of the items, but she didn’t find anything enjoyable. The cucumber with the tomato carpaccio was too tart, the watermelon too sweet, and the Sicilian eggplant bland. She did like the mushroom tartar that we used to spread on the toasted bread (it looked like caviar). I actually agreed that this round of the charcuterie was not as enticing as earlier this year. 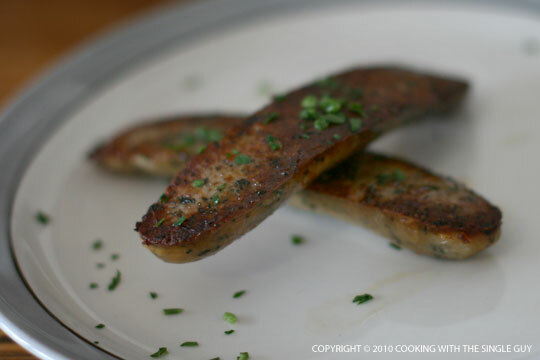 The tofu sausage was a bit tough to eat, and everything was bathed in olive oil. But I did like the watermelon and Jimmy Nardellos Italian pepper. 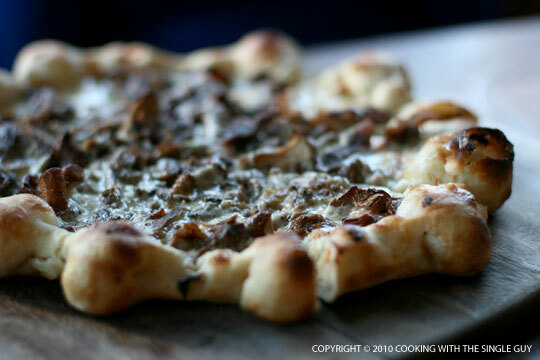 During my first visit, I was too full of pizzas at the time to try Gather’s version. But this time we went for the pizza, and not just one but two. The first is a special for the day (and because it’s a special, it’s not listed on the menu so I forgot the ingredients, but it was primarily a braised meat with cheese). Gather’s pizza is in between a thin crispy crust and a thick crust pizza. So the crust is thin but not crispy but more doughy. 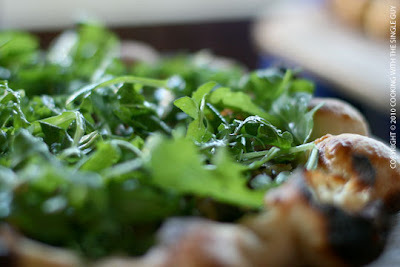 I enjoyed the savory flavors of the special pizza, and the bubble edge of the crust was like eating puff pastry. My sister wanted to try the Knoll Farms fig pizza ($18), which came out looking like a garden because of the bed of brilliant green arugula on top. Underneath all the greens were the sweet figs. I wasn’t a fan of this pizza because the figs were too sweet, so it was like eating dessert, but my Mom actually said she liked it. 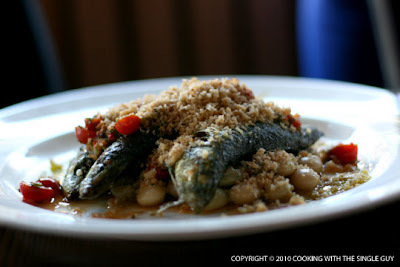 We also ordered a couple of large plates to share, including the whole roasted sardines, which were four Monterey sardines topped with a heaping serving of breadcrumbs. The sardines were cooked perfectly, and I really enjoyed the braised shelling beans underneath. 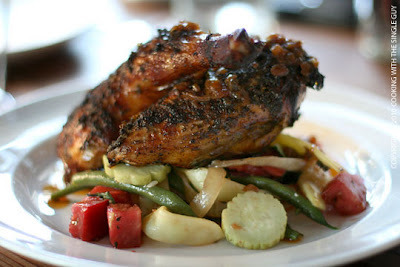 But I think the star of the night was the Barbecued Young Chicken ($19.50) because it was perfectly cooked tender and served with a refreshing and bright summer panzanella salad of green beans, lemon cucumbers, and toasted bread. Everyone enjoyed the chicken and I especially enjoyed the salad. We capped off our night with some desserts. My sister ordered the home-made frozen yogurt ($3), which was nectarine flavor with a pretty orange-pink hue. 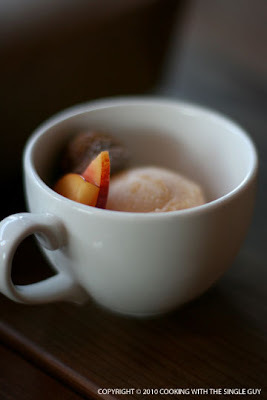 During my first visit a plum sorbet was too tart, but this nectarine yogurt was actually just right. I went for the Scarlett Royal grape trifle ($8.50). As some of you know, a trifle is an English dessert with layered cake, cream and fruits. 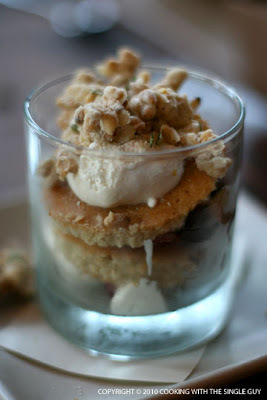 Gather’s version is a rustic layering of cashew cake, verbena mascarpone whipped cream and slices of the fresh grape. Adding a nice crunch was the bits of pine nut brittle that my Mom thought was too sweet. I agree, but I looked past it because of the nice crunch it gave to the overall dessert. In my first visit, I talked about the service being a bit awkward, seeming like everyone was new and getting his or her feet wet. More than six months later, it still seems like the servers are finding their groove. While they were pleasant, they lacked the enthusiasm or friendliness at other professionally run restaurants. For example, our server welcomed us at the table but not once told us her name. Then she passed us off to another server because her shift was ending. Some of the other servers weren’t exactly sure of ingredients when we asked. Again, they were all pleasant, but still a bit rough around the edges. You can guess my Mom, who primarily eats Hong Kong-style Chinese food, weren’t impressed. My sister and I welcomed the respite from the heavy dishes, but I did feel the limited seasonal menu has yet to find some true winners. Update experience (previously 3.25 stars): Haven’t been able to progress much since opening, so stuck at 3.25 stars. I'm on a long weekend because my Mom and sister is in town for a few days, and it's my chance to catch up on my Chinese dining because for my Mom she's more excited about a new restaurant than Coit Tower. 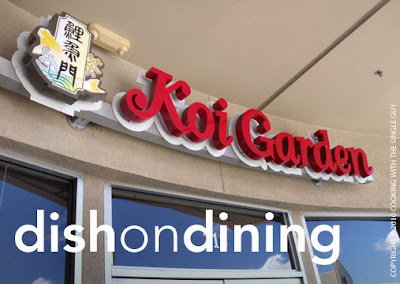 On Saturday, I decided to take her to Koi Garden in Dublin since my sister had a rental car and I had yet to try this East Bay outlet of the extremely popular Koi Palace. 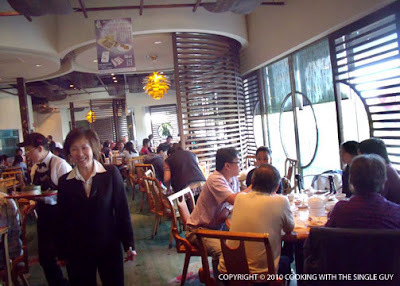 I've taken my Mom to Koi Palace a few times and she always loved the variety of dim sum so I was hoping its sister outlet would deliver. Joining us were my uncle and aunt, and another aunt and cousin visiting from Los Angeles. Getting dim sum is usually fun with a large party, but I always get nervous about how much of a wait it would be for a party of seven. First off, it took awhile to find the strip mall that houses Koi Garden. There's no clear signage with the street numbers, so you really just have to know that you're going to the strip mall that has the Bank of America branch up front. After we finally got there around 1 p.m., we walked into the restaurant on the second floor of the complex and got a number. 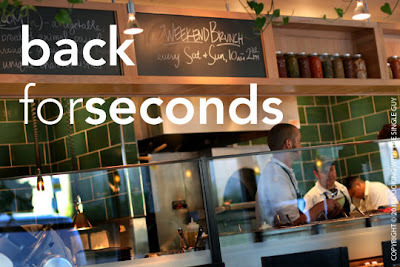 There actually weren't that many people waiting for tables, and the restaurant didn't look too packed. 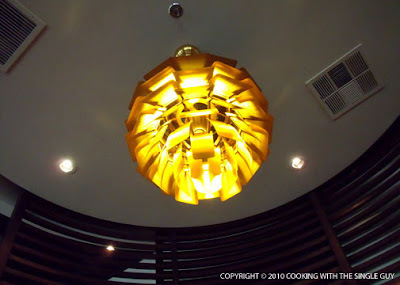 The design was a contemporary Asian styling with several spotlight areas for family tables. This was where we ended up sitting at after a few minutes of waiting. Koi Garden's dim sum is served up the same way like Koi Palace, where women walk around with trays of specific dishes. You can also order dishes off of the paper menu. We did both. 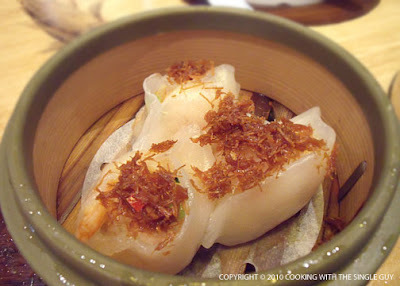 This was one of the first dishes that came strolling by, a shrimp dumpling with XO sauce. 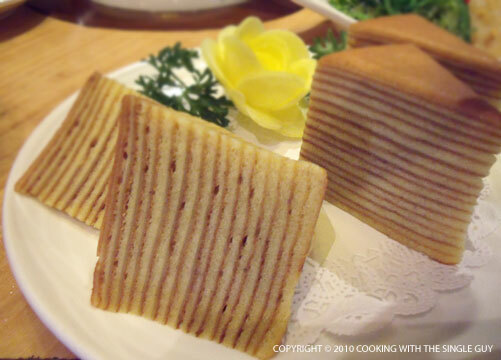 I have to admit, I didn't try this because I'm not a fan of this type of har gao because of the glutinous skin. It looked interesting, though. 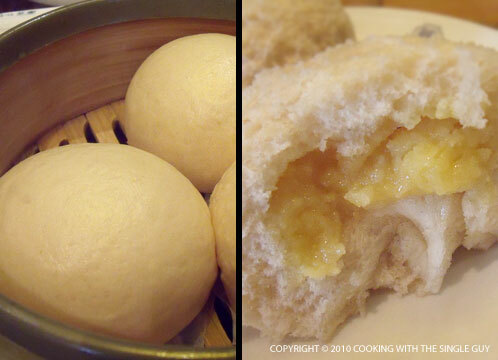 This is one of my favorite things, the custard buns. I typically like these baked, which Koi Palace does well in Daly City. But at Koi Garden they just had the steamed version. Still, I love the creamy sweet custard filling inside. 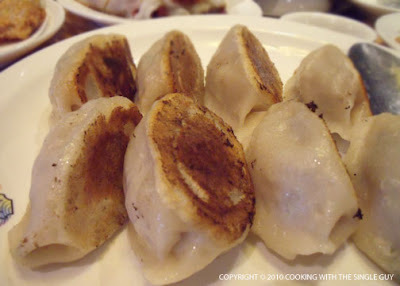 My cousin ordered a bunch of food and she asked me what I wanted and the only thing I mentioned was the xiao lung bao, which are the Shanghai type dumplings with soup inside the dumpling. 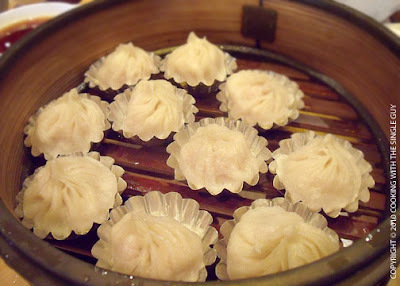 They're my favorite at Koi Palace, and it's made the same way at Koi Garden with the dumplings sitting on their individual silver lining. There seemed to be extra soup in the Koi Garden version, so there was a large burst of soup and flavor when eating this. We also had potstickers, which had a nice blackened bottom. These were huge with a lot of filling. I know, you're wondering what this black thing is. 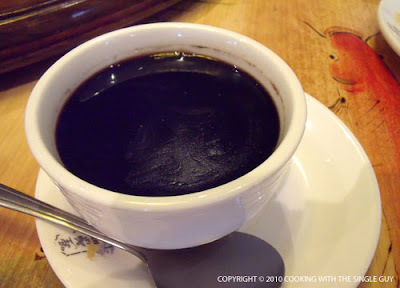 No, it's not black soup. It's a dessert item made with grass jelly. It's basically like black jello, but with an herbal flavor. It's eaten with a douse of simple syrup. Gosh, it seems like we ate a lot of dessert items. This was another one, which is a favorite of my Mom's. It's called a Thousand Layered Cake. It's not exactly a thousand layers, but it looks like so that's how it gets the name. 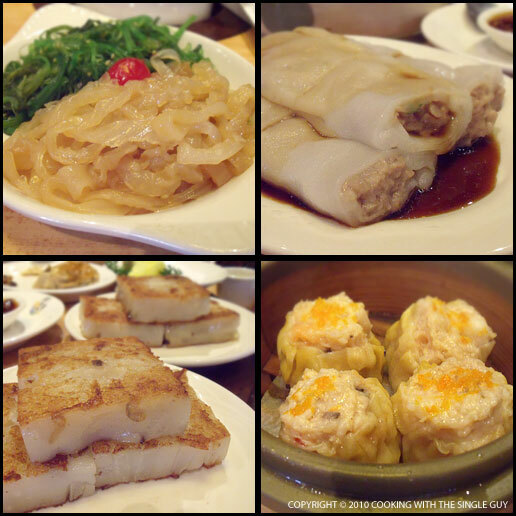 Two things I noticed about Koi Garden and how it compares to Koi Palace: 1) there were fewer specialty dim sum dishes. They had the coffee ribs, but all the other dim sum seemed pretty standard and there weren't as many trays circulating the room, and 2) the service is awful. For some reason, the servers weren't attentive and when you ask for things, they give you a look like it's such a bother. It was really surprising giving the sophisticated surroundings. In the end, it was nice to check out this outlet of the popular Koi Palace. But next time my Mom sweeps into town, we'll probably head to Daly City than Dublin. At Koi Garden, the setting is newer and cleaner, but the service and straight-forward dim sum makes the trek out to that area of the Bay Area a bit of a chore.